The Movie Sleuth: Rumor Mill: The Dark Side of the Force: Kathleen Kennedy To Step Down From Lucasfilm ? Rumor Mill: The Dark Side of the Force: Kathleen Kennedy To Step Down From Lucasfilm ? 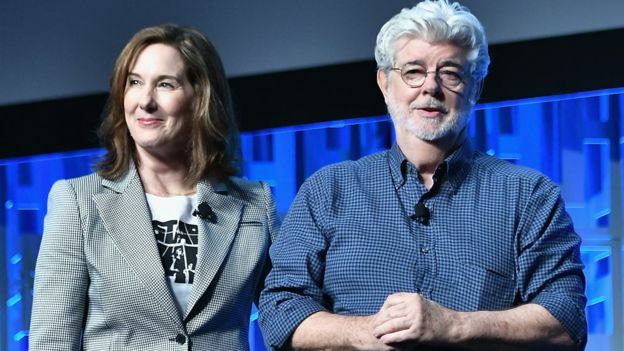 Years ago, when Disney purchased Lucasfilm and all its properties, fans were actually excited at the the prospect of Kathleen Kennedy taking over the megasized franchises that came along with the buyout. It was celebrated that Star Wars would continue on with someone new at the helm. After all, most fans had brandished George Lucas as the destroyer of his very own creation. Now, several films into Disney's continuation of the saga, all is not well in the galaxy. There was a major fan backlash against The Last Jedi and now Solo: A Star Wars Story has turned out to be a box office dud for the mouse house. With a major social media outcry, people threatening boycotts, and fans of the beloved series decrying what's happening to their characters, it looks like the head maven of Lucasfilm may be stepping down. Rumors are blaring across the internet tonight that Kathleen Kennedy will either step down from her role at Lucasfilm or will be removed by the corporate heads at Disney. Screenrant reports that their source The Ankler has the inside scoop on her departure. Apparently, she may no longer be part of the studio past September. At this point, it's all speculation and rumor. But with Star Wars in flux and fans not so sure of these latest entries, it might be time for Kathleen to find a new home with another studio. Although we don't agree with all the backlash, sometimes it's better to depart before things get too ugly.